Not sure what these variables mean? Either watch this short poker video, or read the video’s script below, which will teach you everything you need to know. 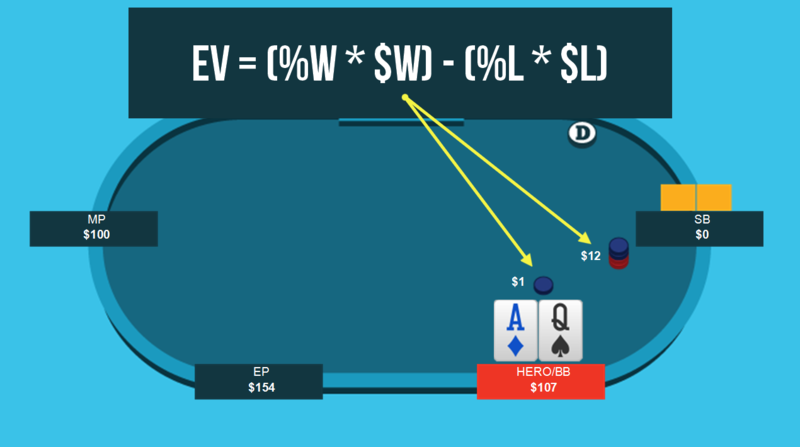 Hello, and welcome to today’s Quick Plays video on the basics of poker EV. 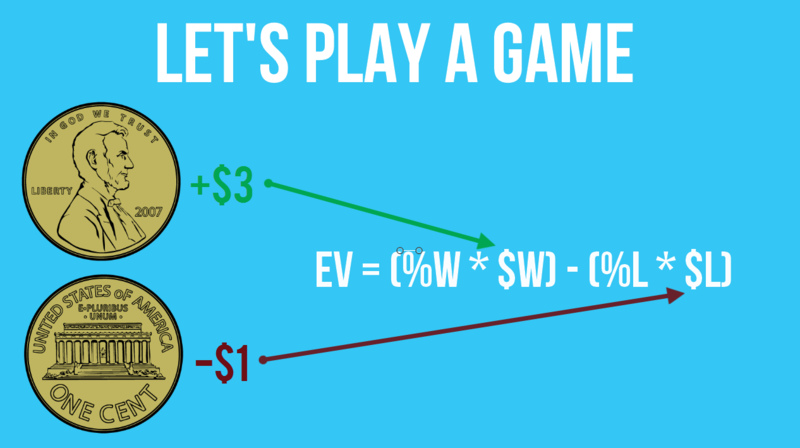 EV, short for expected value, is the most important mathematical concept in poker. Without a solid grasp of EV and ability to create +EV plays, a player is doomed to fail. In this video I’ll show you what EV is, how to use it, and why understanding it vital for poker success. Like I mentioned earlier, EV stands for expected value. It’s the mathematical way of saying “in the longrun this play is expected to net me X amount of money”. Now you may have heard the terms +EV or -EV before, and these simply mean that a play is expected to be profitable in the longrun, or that a play is expected to lose us money in the longrun. Let’s break it down simply. We have %W which is how often we will win a given hand. We have $W which is how much much we will win the times we do in fact win. We have %L which is how often we will lose this hand. And lastly we have $L which is how much money we lose when we lose this hand. Not too bad right? But how can we actually use this? I’m so glad you asked! You and I are going to play a game. It’s a fun game where we take out a fair coin, with one side heads and one side tails, and we flip it. In this game if the coin lands on heads I will pay you $3 and if the coin lands on tails you will pay me $1. If we pull out our EV formula again we can start filling in the variables and solve it. We know that when you win you get $3, so $W = $3, and we know that when I win you lose $1, so $L = $1. We also know that because this is a fair coin that there is a 50% chance of it coming up heads and a 50% chance that it comes up tails. So the W% is 50% and the L% is 50%. Just a quick trick that you can remember is that %W + %L always equals 100%, so if you know one of them you can always figure out the other. So if we do the math quickly we see $1.5 – $.5 = +$1. Which means that in the longrun you are expected to win $1 each time we flip the coin. Now if we only flip the coin two times your only outcomes are +$6, +$2, or -$2…so you can see how in the short term the results can seem quite different than the +$1 expected value we calculated a second ago. But if we flip the coin millions of times you will average a $1 profit each time I flip. 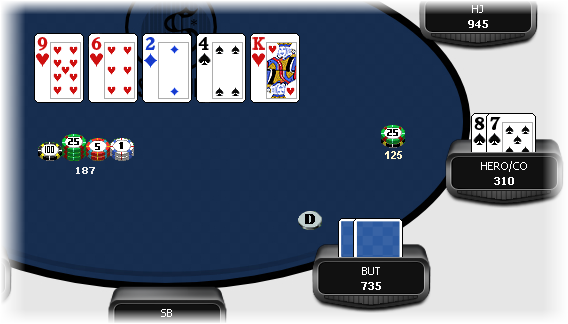 In this hand it folds around to the small blind who goes all-in. We hold AQ and are debating what we want to do. Now that we are armed with the knowledge of EV we can actually proof this situation mathematically. We just pull out our fancy formula and start plugging in numbers. So in this situation we can easily figure out $W and $L. If we call and win we will win the SB’s stack and also our $1 big blind. Once money has been put into the pot, even just a forced bet like the big blind, it no longer belongs to us. That means the $W in this spot is $1 + $12 for $13 total. The $L is simply how much we would lose if we called this and lost the pot. Well since the $1 big blind doesn’t belong to us we can only lose $11 by calling this. So $L equals $11. The last thing we need is the %W and %L. In the coin example we knew that a coin had a 50/50 chance of coming up heads or tails. But what about in a poker hand? To figure out our %W and %L we can use an equity calculator like Equilab and figure out our equity (or estimated chance of winning) against our opponent’s range of hands. For simplicity’s sake let’s just assume that the SB would shove 77+/AJ+/KQ here. I would normally assign a much wider range, but to make life simpler let’s just use that range for the time being. We can plug that into an equity calculator like Equilab and we see that our AQ has 47% equity. So in this hand we expect when we call AQ will win 47% of the time and of course would lose the other 53% of the time. Now we just plug everything in, solve it, and ensure that a call here is +EV. If we look at our two options here, between calling and folding, a fold would be 0EV because we don’t make or lose anything…and a call would be +EV to the tune of $0.28. This means that a call is not only +EV, it is also optimal here. An optimal play in poker is when it is the absolute most profitable play you can make…and calling here is optimal against the range we assigned. While $0.28 may not seem like a lot of money, if we consistently call here we will net a significant amount of profit in the longrun. In real time you won’t be able to pull out an equity calculator, plug everything into the EV formula, and then solve. But constant practice with solving EV, estimating your equities against various ranges, and simple shortcuts will help you closely eyeball the EV of a play in real-time. And when you have lots of available time when studying, calculate the EV of your plays so that it becomes second-nature. Same as always, if you have any questions please don’t hesitate to ask, otherwise good luck and happy grinding! I also made a Free EV Poker Calculator for my site Red Chip Poker if you need one! So this bet is +EV given that assumption, and of course if he folds even more than 45% of the time this play just gets more and more profitable! These kinds of situations are very common in poker and by using EV we can proof the validity of our plays. If you are interested in calculating the EV of all-in situations automatically, grab my free EV spreadsheet from Red Chip Poker (useful for doing these calculations quickly rather than by hand)!